A new study shows the Arctic climate system may be more sensitive to greenhouse warming than previously thought, and that current levels of Earth's atmospheric carbon dioxide may be high enough to bring about significant, irreversible shifts in Arctic ecosystems. Led by the University of Colorado at Boulder, the international study indicated that while the mean annual temperature on Ellesmere Island in the High Arctic during the Pliocene Epoch 2.6 to 5.3 million years ago was about 34 degrees Fahrenheit, or 19 degrees Celsius, warmer than today, CO2 levels were only slightly higher than present. The vast majority of climate scientists agree Earth is warming due to increased concentrations of heat-trapping atmospheric gases generated primarily by human activities like fossil fuel burning and deforestation. The team used three independent methods of measuring the Pliocene temperatures on Ellesmere Island in Canada's High Arctic. They included measurements of oxygen isotopes found in the cellulose of fossil trees and mosses that reveal temperatures and precipitation levels tied to ancient water, an analysis of the distribution of lipids in soil bacteria which correlate with temperature, and an inventory of ancient Pliocene plant groups that overlap in range with contemporary vegetation. "Our findings indicate that CO2 levels of approximately 400 parts per million are sufficient to produce mean annual temperatures in the High Arctic of approximately 0 degrees Celsius (32 degrees F)," Ballantyne said. "As temperatures approach 0 degrees Celsius, it becomes exceedingly difficult to maintain permanent sea and glacial ice in the Arctic. Thus current levels of CO2 in the atmosphere of approximately 390 parts per million may be approaching a tipping point for irreversible ice-free conditions in the Arctic." A paper on the subject is being published in the July issue of the journal Geology. Co-authors included David Greenwood of Brandon University in Manitoba, Canada, Jaap Sinninghe Damste of the Royal Netherlands Institute for Sea Research, Adam Csank of the University of Arizona, Natalia Rybczynski of the Canadian Museum of Nature in Ottawa and Jaelyn Eberle, curator of fossil vertebrates at the University of Colorado Museum of Natural History and an associate professor in the geological sciences department. Arctic temperatures have risen by about 1.8 degrees F, or 1 degree C, in the past two decades in response to anthropogenic greenhouse warming, a trend expected to continue in the coming decades and centuries, said Ballantyne. Greenhouse gases in the atmosphere have risen from about 280 parts per million during the pre-industrial era on Earth to about 390 parts per million today. During the Pliocene, Ellesmere Island hosted forests of larch, dwarf birch and northern white cedar trees, as well as mosses and herbs, including cinquefoils. The island also was home to fish, frogs and now extinct mammals that included tiny deer, ancient relatives of the black bear, three-toed horses, small beavers, rabbits, badgers and shrews. Because of the high latitude, the Ellesmere Island site on the Strathcona Fiord was shrouded by darkness six months out of the year, said Rybczynski. Fossils are often preserved in a process known as permineralization, in which mineral deposits form internal casts of organisms. But at the Ellesmere Island site known as the "Beaver Pond site," organic materials -- including trees, plants and mosses -- have been "mummified" in peat deposits, allowing the researchers to conduct detailed, high-quality analyses, said Eberle. Ballantyne said the high level of preservation of trees and mosses at Ellesmere Island allowed the team to measure the ratio of oxygen isotopes in plant cellulose, providing information on water absorbed from precipitation during the Pliocene and which yielded estimates of past surface temperatures. The team also compared data on the width of tree rings in larch trees at the Beaver Pond site to trees at lower latitudes today to help them estimate past temperatures and precipitation levels. The researchers also analyzed the distribution of ancient membrane lipids from soil bacteria known as tetraethers, which correlate to temperature. The chemical structure of the fossilized tetraethers makes them highly sensitive to both temperature and acidity, or pH, said Ballantyne. The last line of evidence put forward by the CU-Boulder-led team was a comparison of Pliocene ancient vegetation at the site with vegetation present today, providing a clear "climate window" showing the overlap of the two time periods. "The results of the three independent temperature proxies are remarkably consistent," said Eberle. "We essentially were able to ‘read' the vegetation in order to estimate air temperatures in the Pliocene." Today, Ellesmere Island is a polar desert that features tundra, permafrost, ice sheets, sparse vegetation and a few small mammals. Temperatures range from roughly minus 37 degrees F, or minus 38 degrees C, in winter to 48 degrees F, or 9 degrees C, in summer. The region is one of the coldest, driest environments on Earth. "Our findings are somewhat disconcerting regarding the temperatures and greenhouse gas levels during the Pliocene," said Eberle. "We already are seeing evidence of both mammals and birds moving northward as the climate warms, and I can't help but wonder if the Arctic is headed toward conditions similar to those that existed during the Pliocene." Elevated Arctic temperatures during the Pliocene -- which occurred shortly before Earth plunged into an ice age about 2.5 million years ago -- are thought to have been driven by the transfer of heat to the polar regions and perhaps by decreased reflectivity of sunlight hitting the Arctic due to a lack of ice, said Ballantyne. One big question is why the Arctic was so sensitive to warming during this period, he said. Multiple feedback mechanisms have been proposed to explain the amplification of Arctic temperatures, including the reflectivity strength of the sun on Arctic ice and changes in vegetation seasonal cloud cover, said Ballantyne. "I suspect that it is the interactions between these different feedback mechanisms that ultimately produce the warming temperatures in the Arctic." In 2009, CU-Boulder's National Snow and Ice Data Center showed the September Arctic sea ice extent was 649,000 square miles, or 1,680,902 square kilometers, below the 1979-2000 average, and is declining at a rate of 11.2 percent per decade. Some climate change experts are forecasting that the Arctic summers will become ice-free summers within a decade or two. 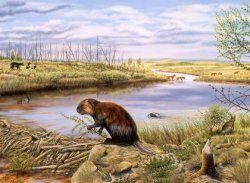 In addition to its exceptional preservation of fossil wood, plants, insects and mollusks, the Beaver Pond site on Ellesmere Island is the only reported Pliocene fossil site in the High Arctic to yield vertebrate remains, said Rybczynski. Eberle said there is high concern by scientists over a proposal to mine coal on Ellesmere Island near the Beaver Pond site by WestStar Resources Inc. headquartered in Vancouver, British Columbia. "Paleontological sites like the Beaver Pond site are unique and extremely valuable resources that are of international importance," said Eberle. "Our concern is that coal mining activities could damage such sites and they will be lost forever."